Palliative Care is specialized medical care and advanced care planning for people facing a chronic/serious illness. Care focuses on providing relief from the stresses and symptoms of an illness. The goal is to enhance and improve quality of life for both the patient and family. Palliative Care is provided by a specially-trained team of experienced medical professionals, including: doctors, nurses and other specialists who work together partnering with patient’s primary providers to provide an extra layer of support. Palliative Care is appropriate at any age and stage of a serious illness, and may be provided along with curative treatments. What is Community Care Choices? Community Care Choices is a Palliative Care Program that provides compassionate care to patients with serious illnesses through symptom management, education and support. Our specially trained staff in collaboration with our patient and their physician will develop an individualized care plan to provide comfort and pain and symptom management to improve quality of life. Through Community Care Choices, a patient’s physician will continue to manage care in partnership with our staff. Our team also provides education, support and other community resources. Community Care Choices offers a team of experts with experience you can trust. Our Medical Director is experienced in Palliative Care and many of our nurses and other clinical staff members are nationally certified in Hospice and Palliative Care within in their respective fields. Our specially trained staff provides compassionate care to patients with serious illnesses through symptom management, education and support. A lot of time will be spent with you and your family to assess your pain level and other symptoms. Collaboratively, they will discuss and explain all of your treatment options and develop a plan of care specific to your needs. 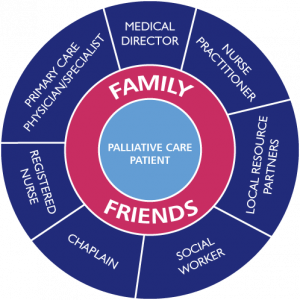 Preparing to meet your Palliative Care Team? When meeting your Palliative Care Team for the first time it can be helpful to have a list of questions prepared. Here are some suggestions to help ease the process and make sure your time addresses all your concerns. Where will my care be provided? What do you recommend for my care? Does my family need to make any decisions? Should I have a surrogate decision maker? Will you explain my treatment options and the issues involved in making these decisions? How will you communicate with me and my family about my illness? If I am admitted to the hospital, will you continue to be involved in my care? How will you partner with my doctors? How will you help me if I experience severe pain or other symptoms? What support do you offer my family and/or caregivers? What is the best way to reach you when I need you? To learn more about Community Care Choices or to make a referral, call 209.578.6333 or complete the form below.